With the hinge and the right technique succeeds a gap-free attachment of height, side and ailerons. 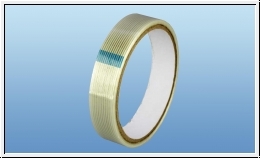 It is highly elastic, transparent and particularly resistant to tearing through the longitudinal glass threads. This Product was added to our catalogue on Thursday, 24. April 2014.